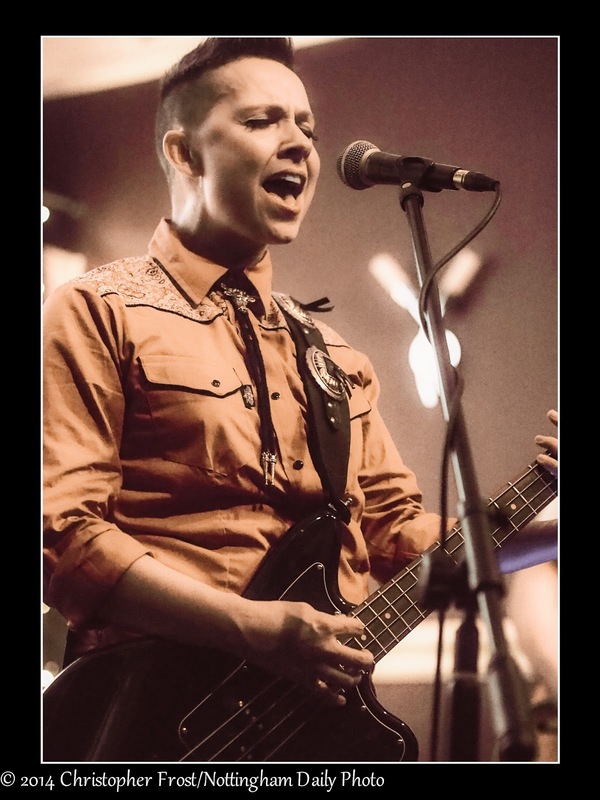 No, this is not Madeline, her name is Lucy and she is the singer and bass guitarist with local rock band The Madeline Rust. Although they are based in Beeston, Gail & I went to see them at a gig last night in Litchfield, which is in the West Midlands. Of course they were as good as when I saw them in the city centre in August, although the venue wasn't as well lit, so I had to increase the ISO a bit to make the images useable. 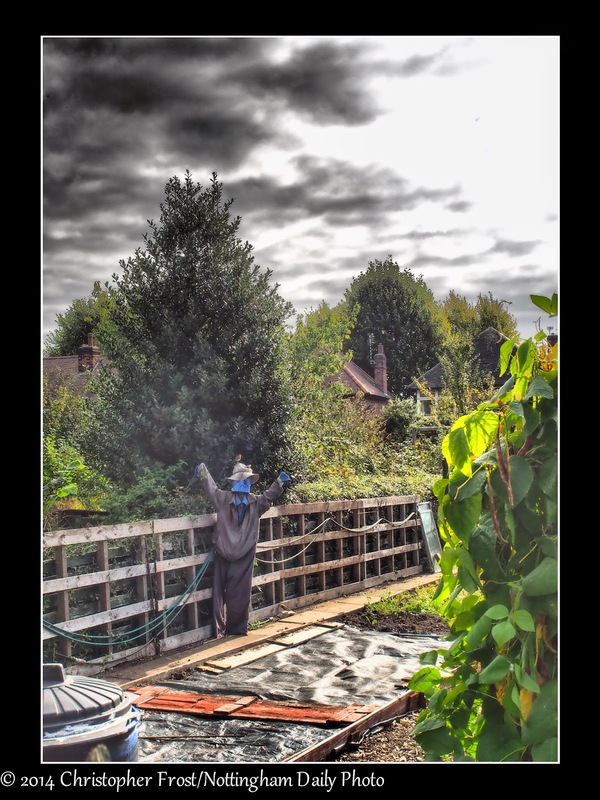 I took this shot whilst having a walk around some local allotments. I like to think that the scarecrow is doing its job right and is chasing away the stormclouds. A sunny lunchtime today, so I took a stroll around the Lace Market. Whilst I was walking along, I began to notice that there seemed to be a lot of photography students about in small groups and all carrying cameras. Passing through St Mary's churchyard, I saw a couple of girls trying to take a photo of another girl who was hiding herself in-between the branches of a tree. They were obviously trying to learn about light and shade. 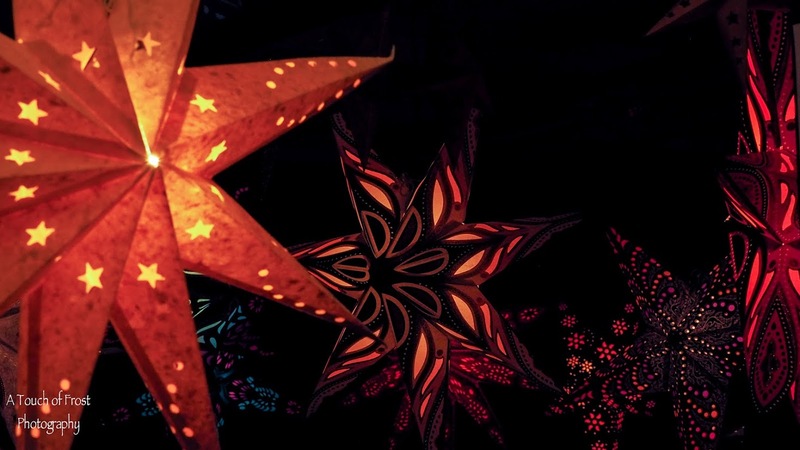 One said that it was too dark to take a photo, and I thought that they should either increase the ISO, reduce the shutter speed or change the lens's f stop. If anyone is interested, I took this with my 45mm lens, 100 ISO, f1.8 at 1/60th. Also slightly tweaked in Lightroom. 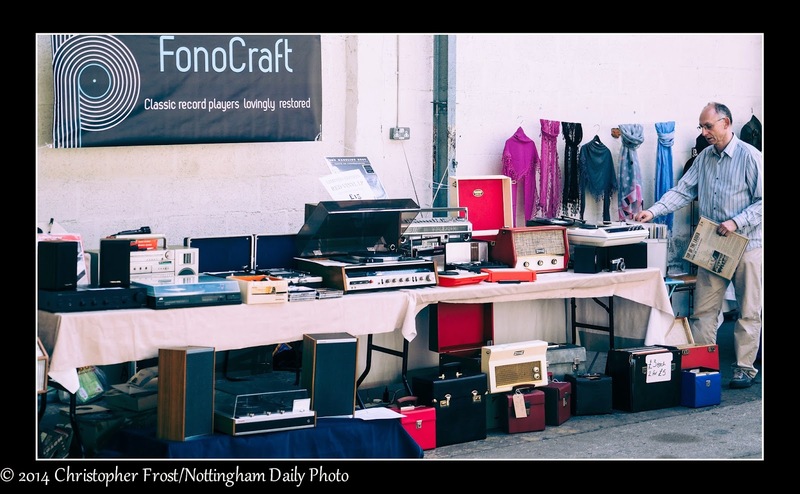 If you are a record collector, then to get that authentic vinyl sound you'll need one of these, an original record player. Nothing digital here. Analogue audio all the way. 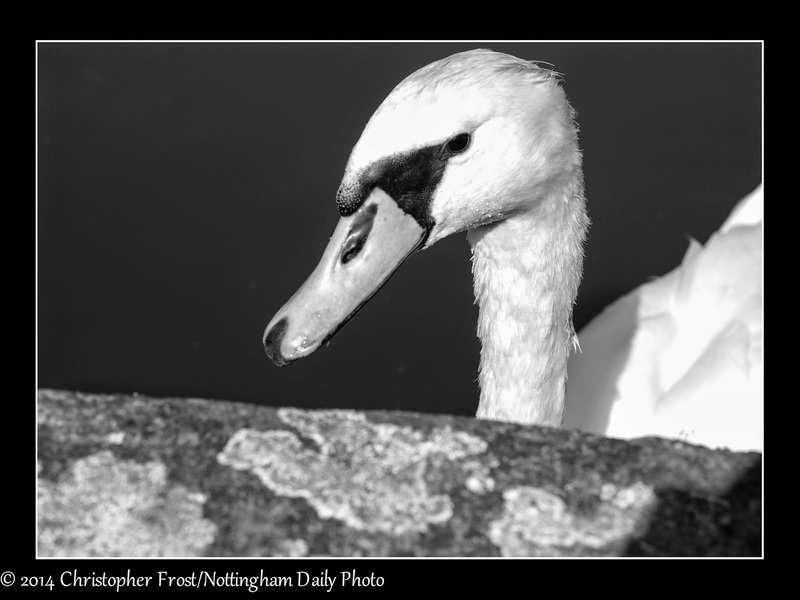 A swan mistakenly thinking that I'd bought him some food. Sadly not, I only wanted to take his photo. 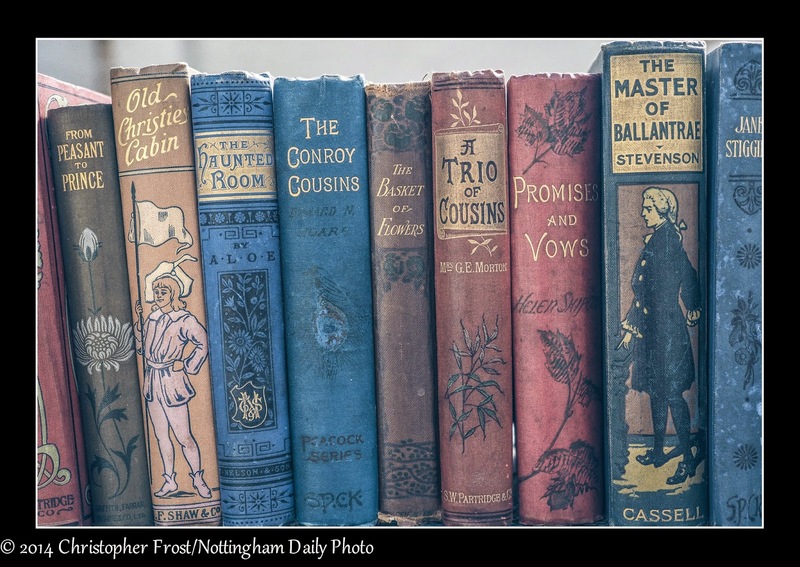 A collection of old books that I came across on a stall recently at a vintage market. Certainly a wide range of colours, designs and titles. And I must admit that I have never read any of the stories. Although The Master of Ballantrae is the only one that I have ever heard of. 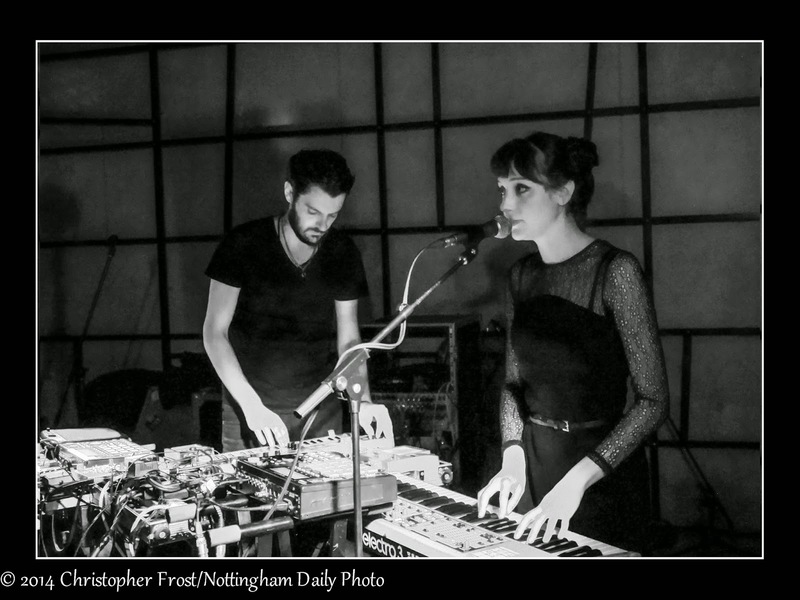 This is Manchester based electro band Shield Patterns, who played at the Contemporary on Saturday night. I really went to see the support band who I like called One Girl One Boy, but stayed to listen to this duo, and thought they were very good. They played in almost darkness, except for a couple of red lights, so I thought it would look better as a black & white. 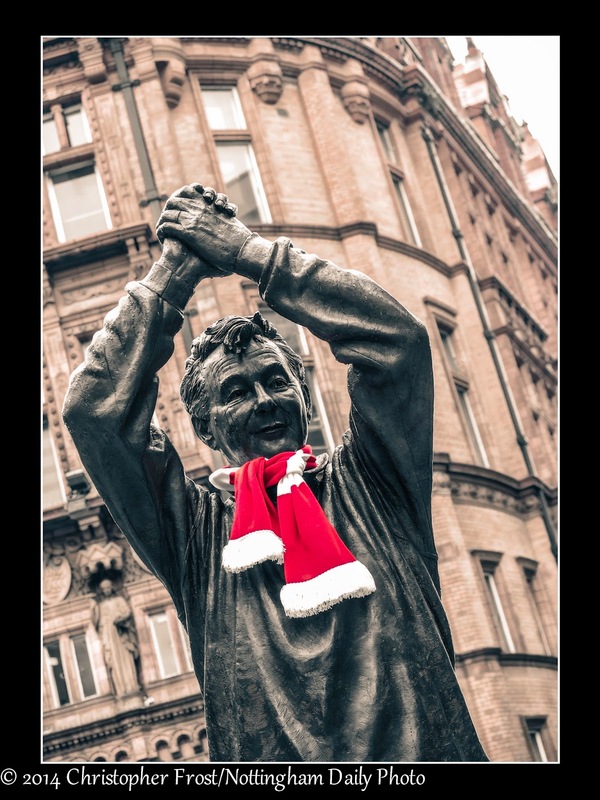 Someone had carefully wrapped a scarf around the neck of the Brian Clough statue in town, to mark the 10th anniversary of his death. For those that don't know, Brian Clough was the manager of Nottingham Forest football team during the 70s and was quite successful on the field. I'm not a football fan, so I couldn't tell you what and when, but if you're interested, then I'm sure that you can find out through Google. 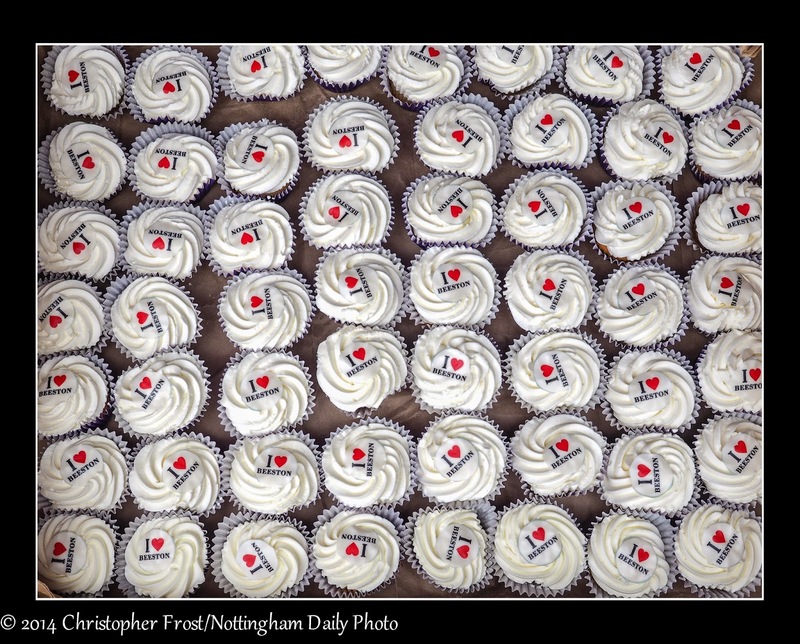 All these delicious cream cakes were handed out to people who visited the Picnic in the Park today at Broadgate Park. It was quite well attended with a face painting stall, story telling and a juggler on offer to entertain people. But of course it was the cakes that drew the most interest, created by a local bakery opposite the park. 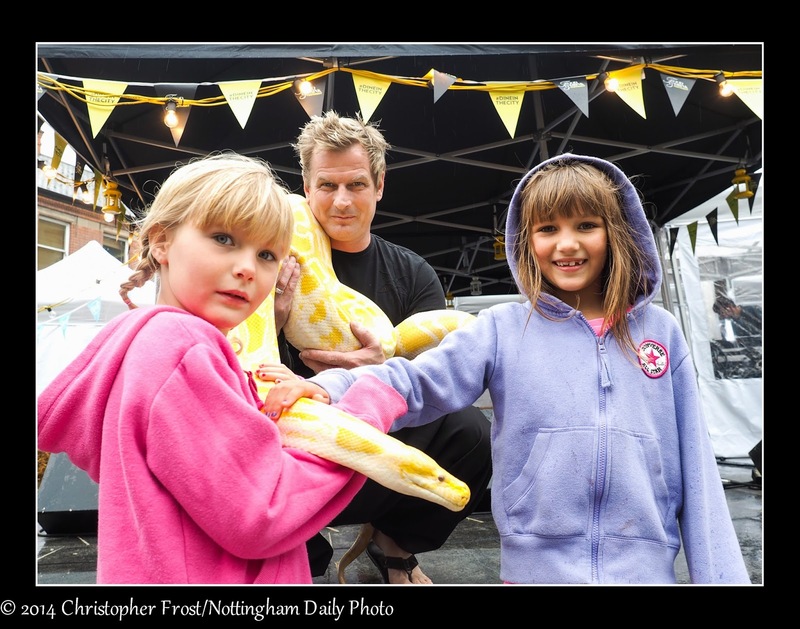 It's not everyday that you meet a snake at a food fair. But I did today, and fortunately he wasn't on the menu! The food fair took place in the revamped Trinity Square, but sadly wasn't that busy, due to the rainy weather. I saw a chef I know that owns our favourite Indian restaurant called the Curry Lounge with his wife and brother, who were promoting their new range of chutneys. Anyway back to the snake. According to the Gordon Ramsey lookalike, it is an Albino Burmese python. These girls didn't appear to be scared of it, so I decided to give it a stroke, and was surprised that it's body was warm and dry, as I was expecting it to be the opposite. 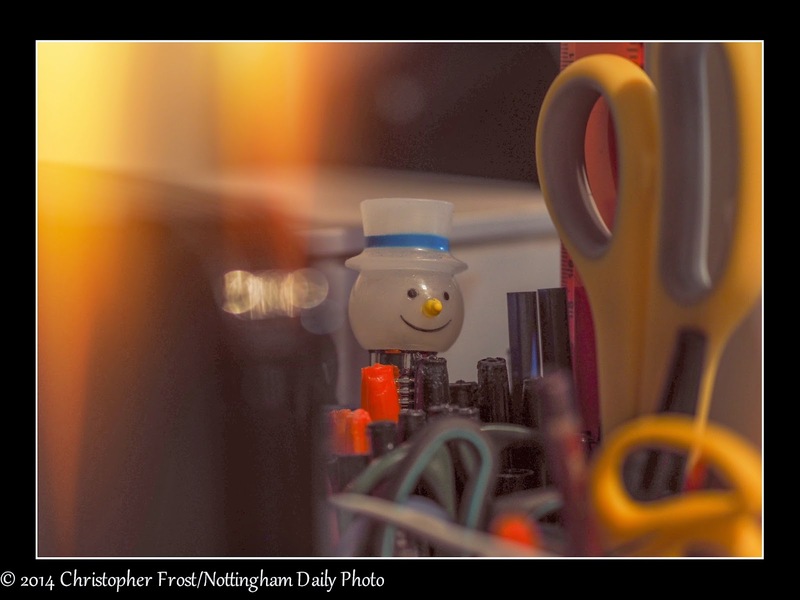 I was just testing my camera and I shot this still life scene by accident. Thought it looked quite amusing, and so I thought I would share it with you all. 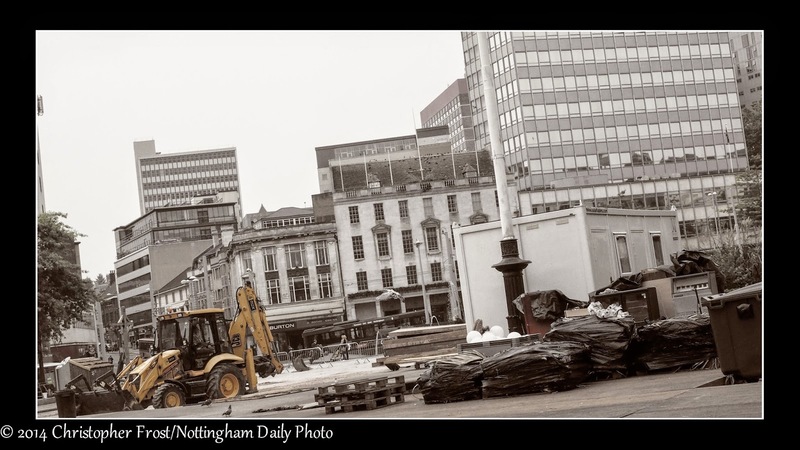 There is a lot of activity in the Old Market Square at the moment, with workmen erecting all sorts of stages, tunnels and booths for an exhibition that takes place later this week. 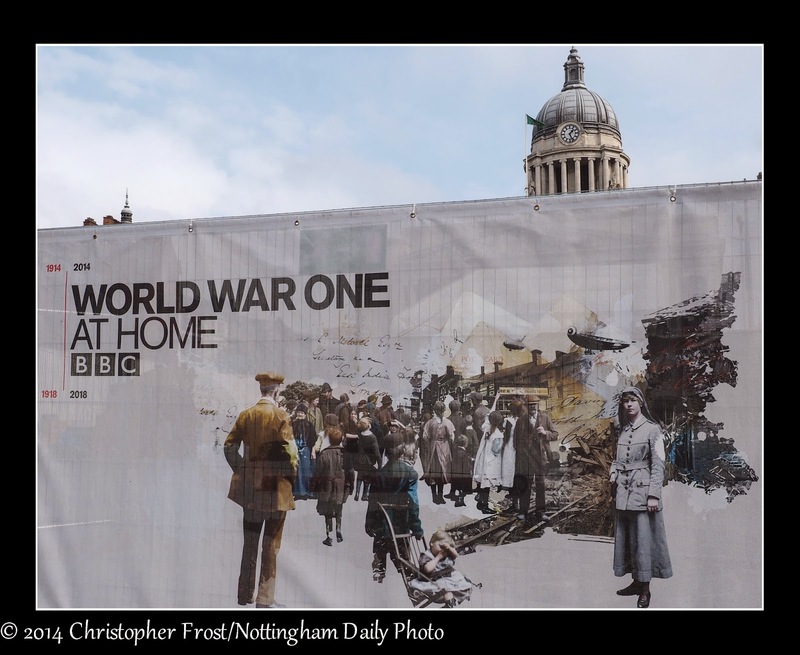 Hopefully there should be plenty to photograph and things to learn about the 'Great War' that began a century ago. 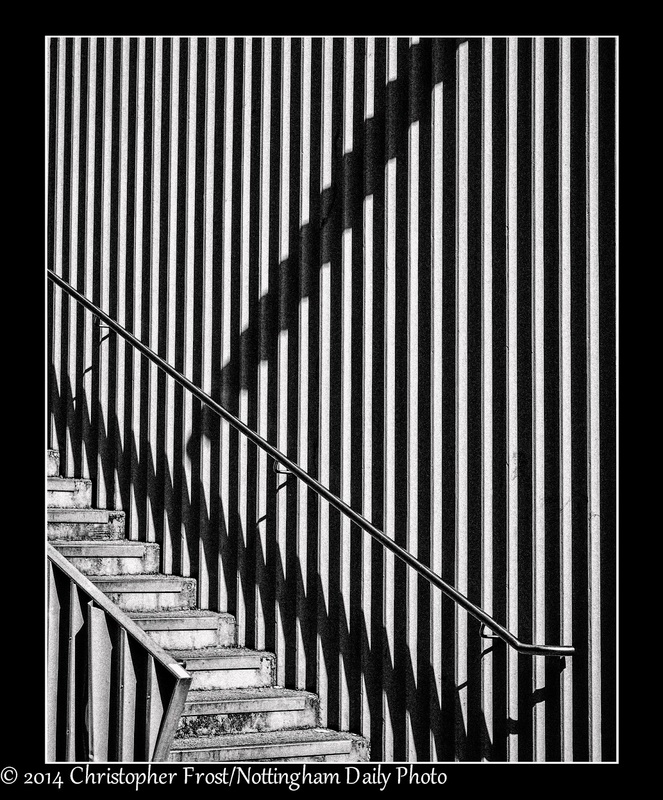 Abstract of a staircase and wall of the Nottingham Contemporary. 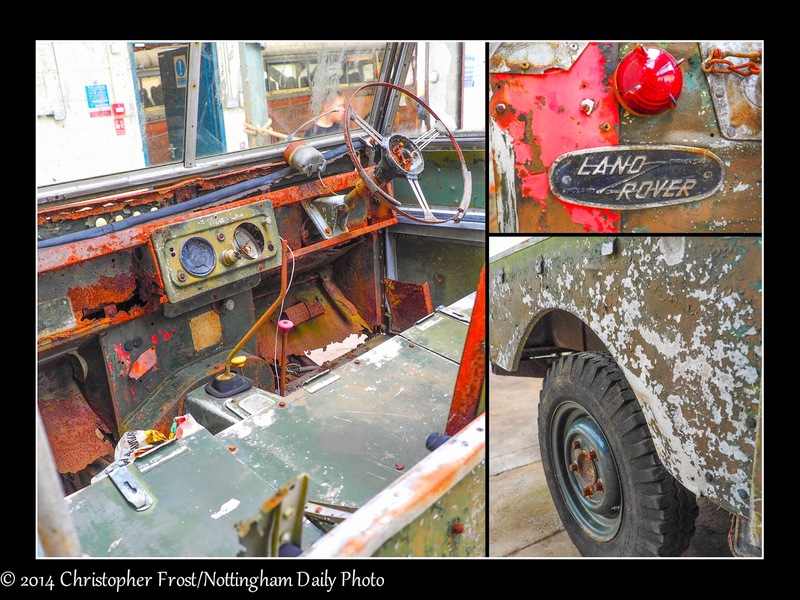 A very old Land Rover that's seen better days. Now on display at Barton's in Chilwell. 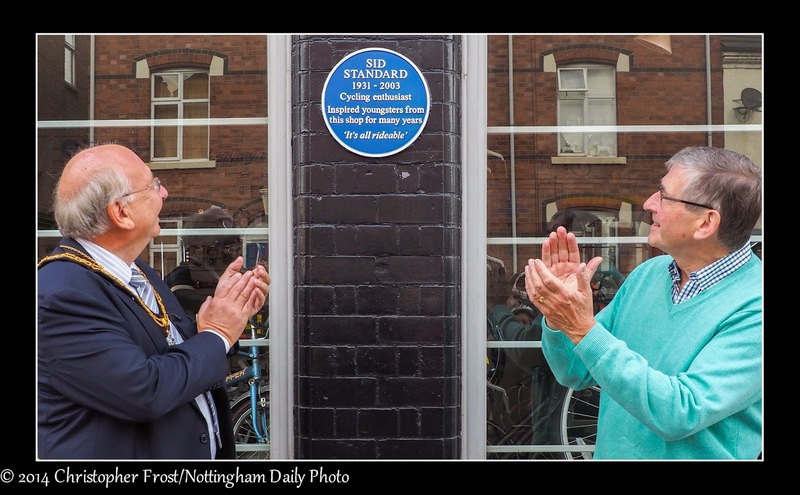 A Blue Plaque unveiling this morning of Beeston cycling legend Sid Standard. Sadly Sid died 11 years ago in ironically a cycling accident on a ride in Derbyshire. Sid owned a shop in Chilwell that everybody went to for new bikes, repairs and spares. It's still there and is now run by a great guy called Kevin. And being a cyclist myself, I'm a regular visitor. Once the ceremony was over, a load of cyclists set off on a ride to Derbyshire, to the same spot that Sid had his accident. 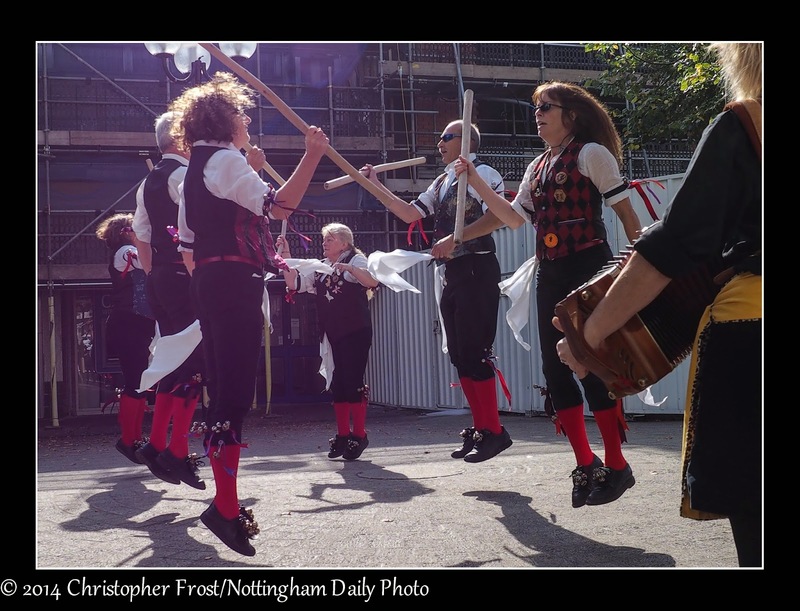 Beeston's heritage has been on display today in many forms; vehicles, talks, photographs and clog & morris dancing. The sun has shined for most of the day and so it helped to make it a nice time for everyone who visited the events. 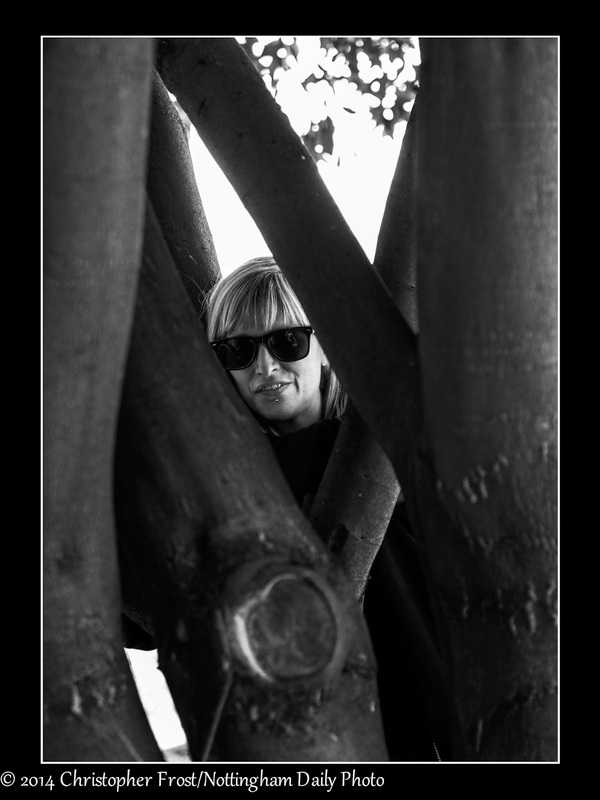 I was out shooting a band tonight and when I had done, I rang Gail to say that I was on my way home. 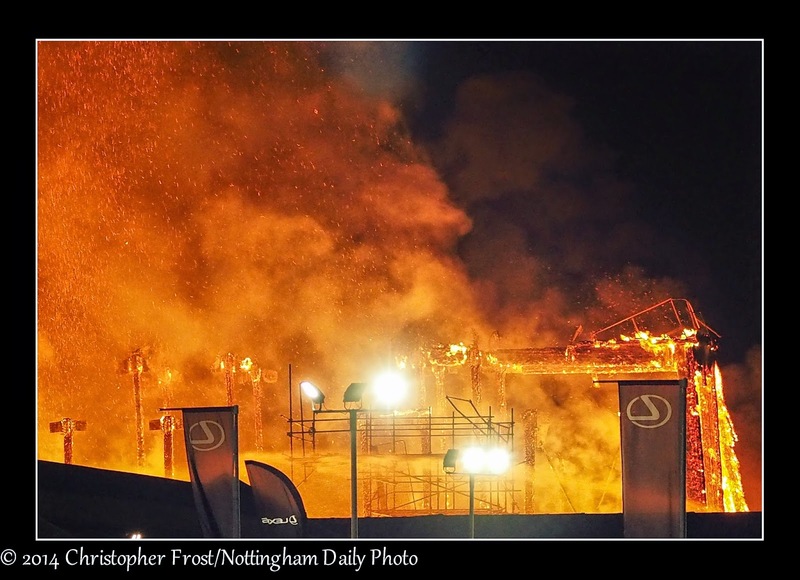 Gail said that she had read on Facebook that there was a big fire at the university's Jubilee Campus. So I sped off in search of some photos. Obviously with such a big fire, all the roads surrounding the campus had been taped off by the police. But Derby Road was still open. So I pulled up on a side street and rushed over to where I thought I could take some decent shots. As I had been shooting in a pub, I didn't have any zoom lenses with me, except for my 12-40 f2.8, which wasn't long enough, but I did have a 75mm f1.8, and a digital teleconverter, so I managed to take some reasonable shots like this one. The building that was burning, wasn't even finished yet. A laboratory, funded by a big pharmaceutical company. It has cost £20 million and was meant to be carbon neutral. Not anymore going on the amount of smoke and flames in the night air. 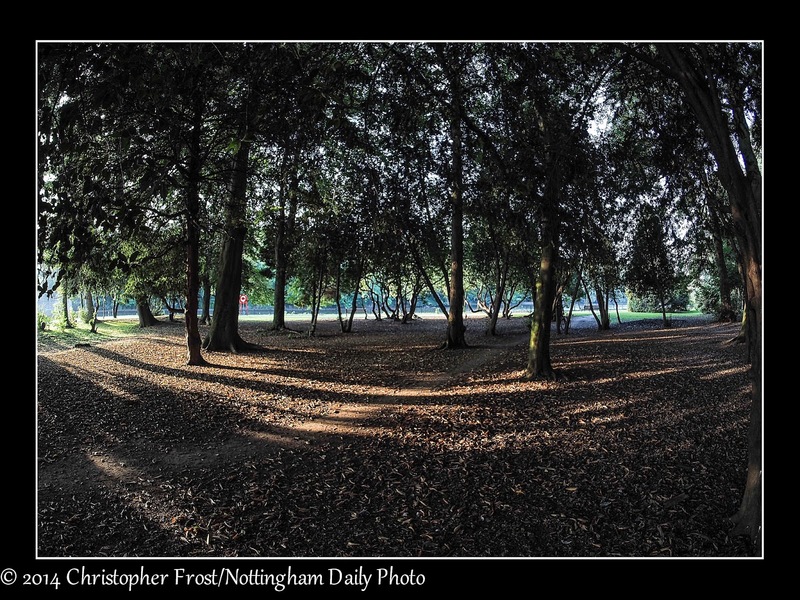 I took my fisheye lens out for some action today and came home with this shot from Highfields. 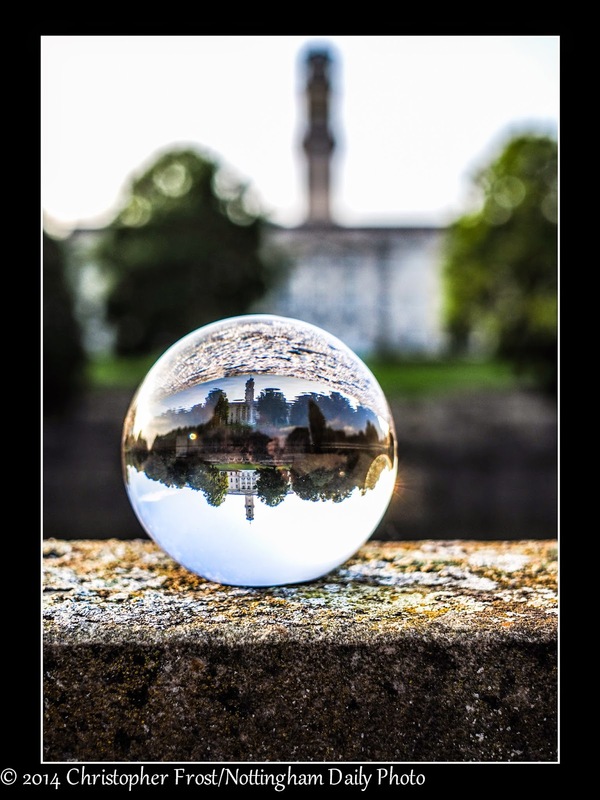 I watched a video the other week about using things to take photos with, and one of them was a globe. I just happen to come across one yesterday in a sale for a couple of quid, so I snapped it up. As it was a sunny evening, I cycled through Highfields and decided to try out my globe. I don't think think that I had the right lens on my camera, but took a few test shots anyway, which this one I think is the best one. 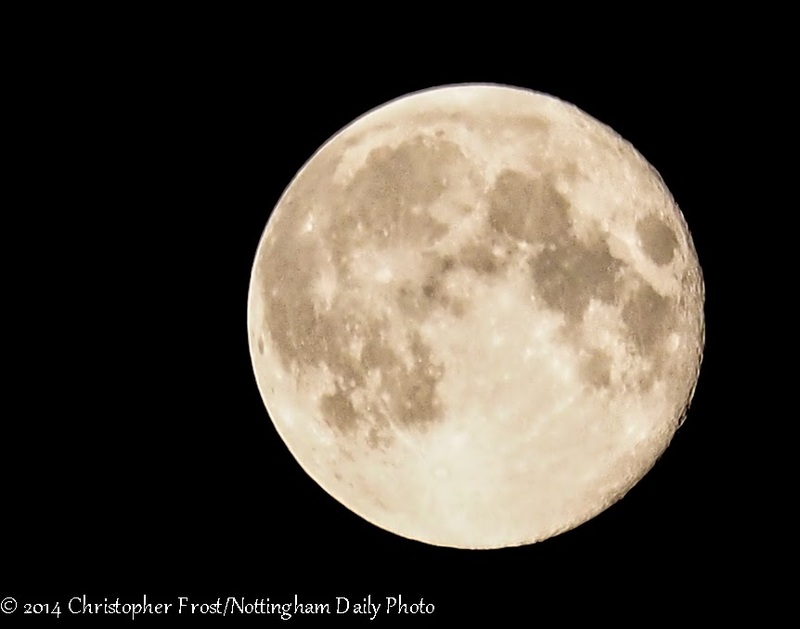 Everyone seems to be posting photos of the 'supermoon', so I thought I would do the same. There's a competition that's just begun in Nottingham, featuring the little Aussie diva Kylie Minogue. 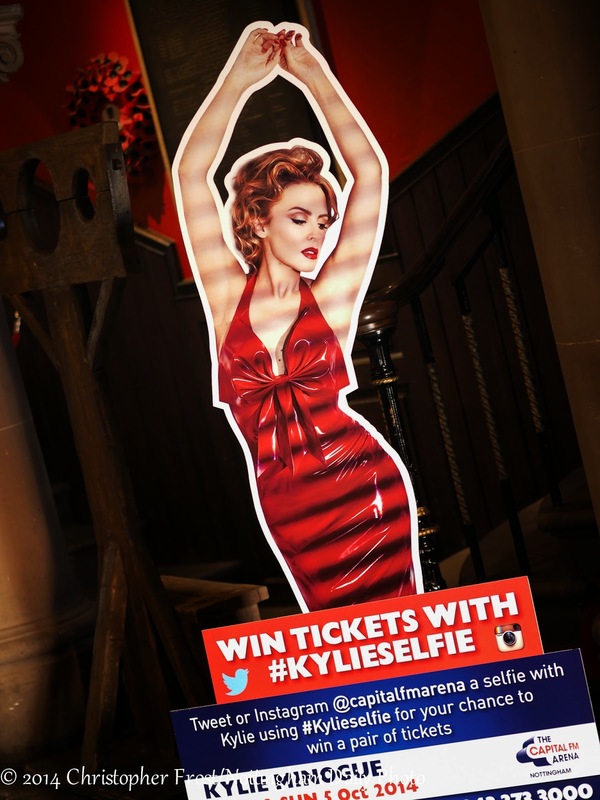 Apparently there are a number of these cardboard cut-outs of her dotted in buildings across the city centre, and if you have your photo taken with her, you get the opportunity of winning two tickets to see her in concert at the Arena next month. I tend not to be a lucky person, so I resisted the opportunity of taking a pic of myself with her and Tweeting it across the world. Instead here is the cardboard cut out all by herself. Sunday morning saw a few hundred people walk around Wollaton Park without any shoes on. It was all done in the name of charity. 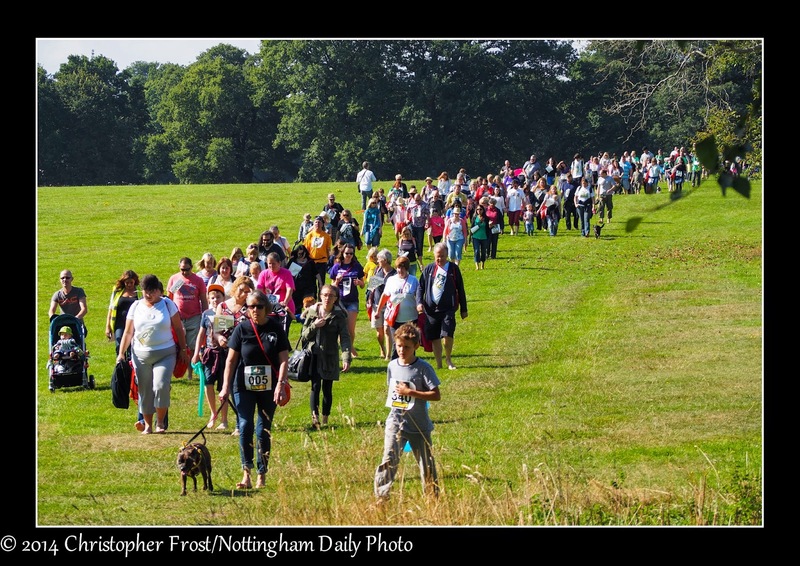 The Nottingham Barefoot Walk was thought of by Lee Todd, and which aims to publicise the fact that there are people in the world that have to walk barefoot every day and so old shoes are collected, to be sent to countries life Africa through the Shoe-Aid scheme. Fortunately it was a lovely sunny & dry day, otherwise people might end up with very muddy and very dirty feet. There was a choice of either a 3km or 5km walk and afterwards a few local bands entertained everyone in the sunshine. 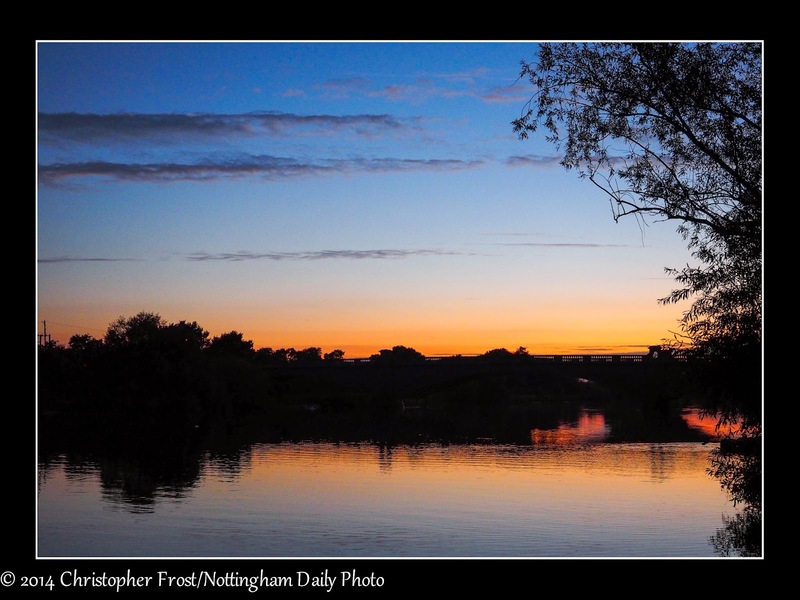 For various reasons I didn't take any photos today, so here's one from last Sunday, a sunset at Gunthorpe. Another day of random shooting. Nothing really interesting except this one. The way the three guys faces work together to make the scene. And I bet you are all thinking the same thing. The guy in the middle has just dropped a very big fart and the guy on the right has smelt it, while the man passing by heard it. Well the summer school holidays are over for another year and I bet all parents are relieved, as it means that they won't have to spend time and money on finding things to do. 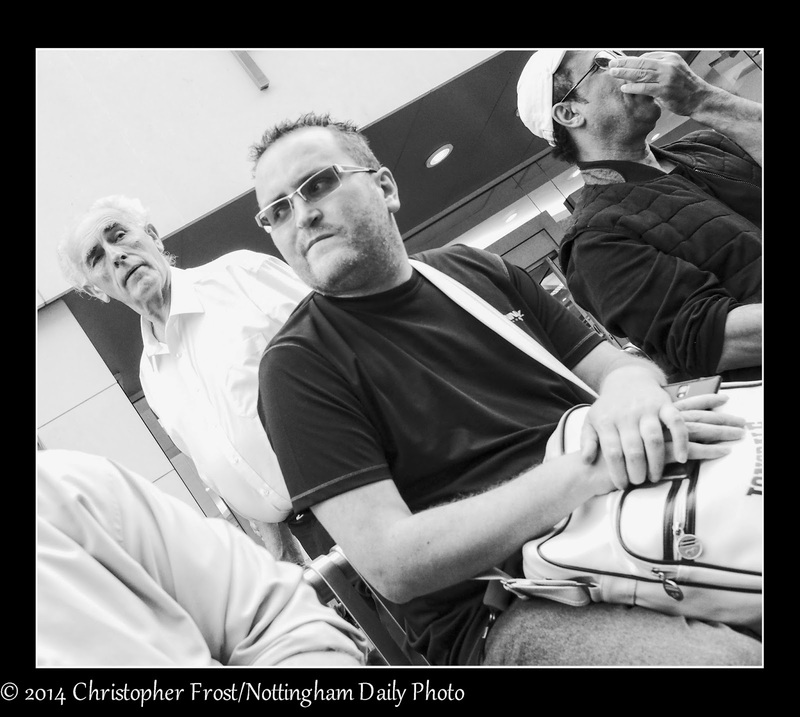 One thing that has been popular has been the Nottingham Riviera, situated in the Old Market Square. But now the kids are back at school, the workmen have started dismantling and packing up all the rides, kiosks and fake palm trees. I don't know what happens to all the sand they laid back in July. Maybe they sell it on to a builder, but it would need sifting, to remove all the bottle tops, empty crisp packets and whatever else finds its way into sand. "You don't spell love, you feel it". 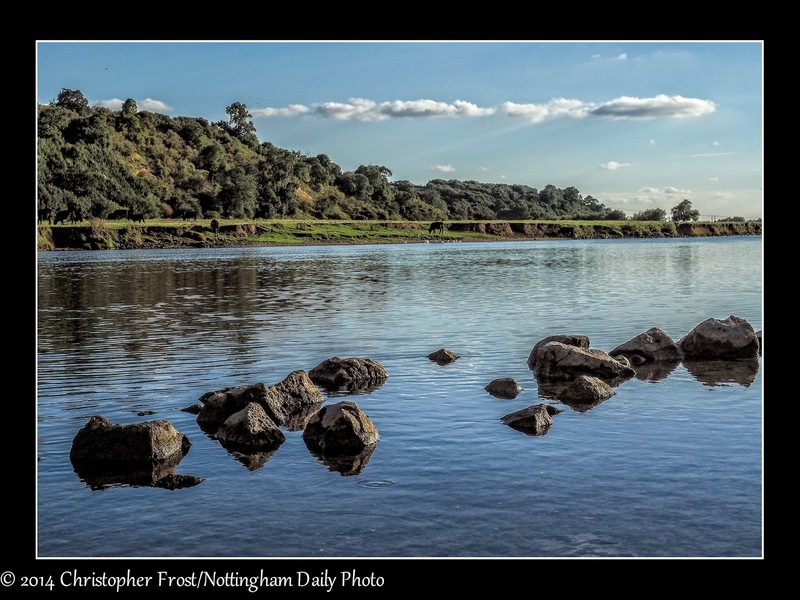 A gentle landscape taken on a warm summers day somewhere in Nottinghamshire. 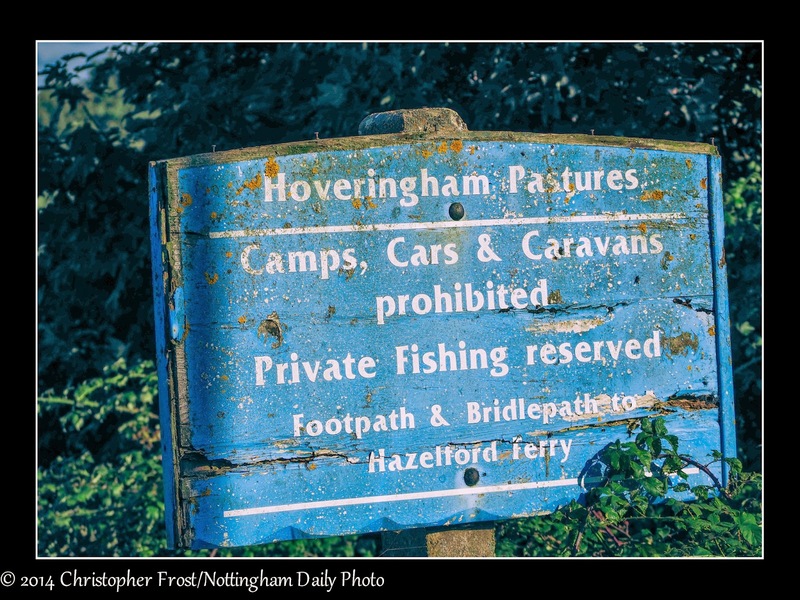 Well if you own a car, a caravan or a tent, you'll not be welcome at Hoveringham Pastures. Mind you, with it being a lovely open space with trees and a river running close by, then you wouldn't want the area spoilt either. Over the weekend I was nominated twice to do the now infamous Ice Bucket Challenge. Being a believer of not wasting water, I had no wish to throw away a perfectly good bucket of H2O, so I thought about how I could be involved, but by not getting wet. I had seen some variations on the theme, but they all seem to involve wasting water in one way or another. 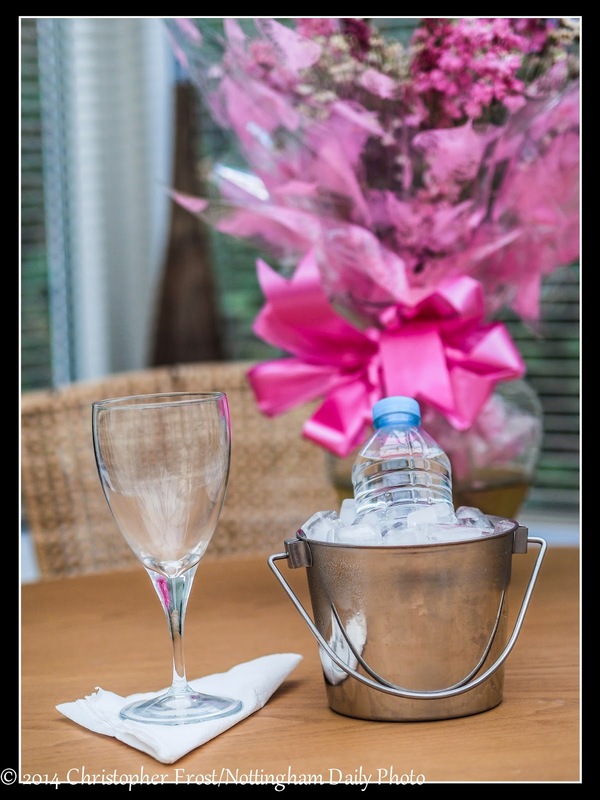 So I went with this concept, of an ice bucket chilling a small bottle of water. Like it was like champagne,;which in some African countries it is. I also wondered about which charity to give my donation to. After some consideration, I decided to go with the local animal rescue that I wrote about a few weeks ago, especially as they put out a message asking for some pouches of wet cat food. They are only a little charity, so every penny counts. Unlike some of the more well known charities, that pay large salaries to the bosses and can afford TV ad campaigns. So after work, I called in to one of our local supermarkets and bought some boxes of cat food, which I then took up to the rescue, so the dear little cats that are looking for a loving forever home will have a nice meal or two tomorrow.